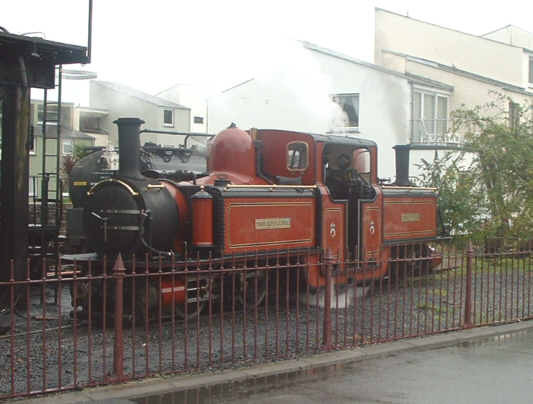 The Ffestiniog is still building Fairlie engines, the first was built in 1879, this one, David Lloyd George was built in 1992. 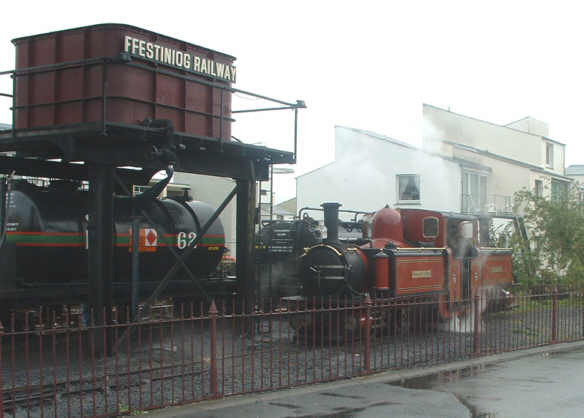 She is seen here taking on oil at Porthmadog station, all the FR's steam locos are oil fired to reduce fire risks. A closer look at David Lloyd George. The Fairlie concept enabled much heavier trains to be hauled by locos that fitted the confined loading gauge of the originally horse and gravity worked line. A diesel loco shunting the oil tanks at Porthmadog, the empties will go back to Boston Lodge works to be refilled. 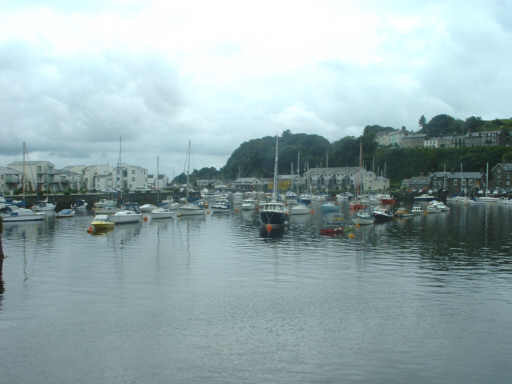 Not a railway in sight, this view is of a very wet Porthmadog harbour, the origins of the FR were is transporting slate down to the quays here for shipping round the coast. 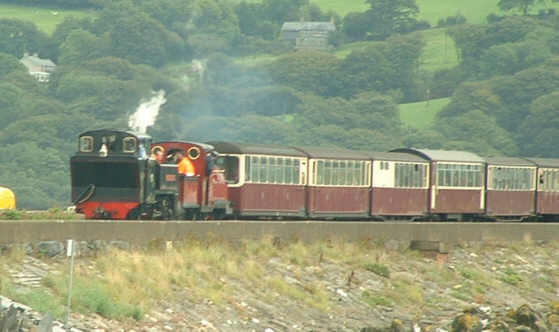 Mountaineer leads Prince across the Cob approaching Porthmadog. 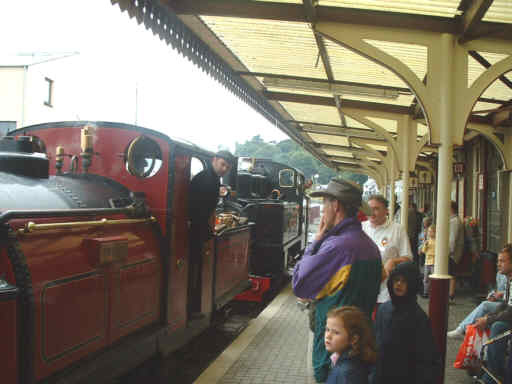 Prince was built for the railway in 1863 and is the oldest regularly working loco in the world! A closer view of the pair nearly into the station. Mountaineer was built by ALCO in 1917 for British Army use in France during WWI. 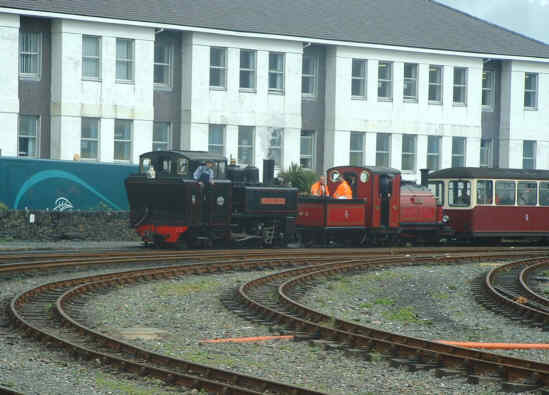 The venerable pair have now arrived in the station with their lengthy train which, after a smart turn round, I caught to go up the line to Blaenau Ffestiniog. The pair setting off for the run up hill to Blaenau, with their small wheels their rods seemed to be going at an incredible rate when I caught sight of them on curves. 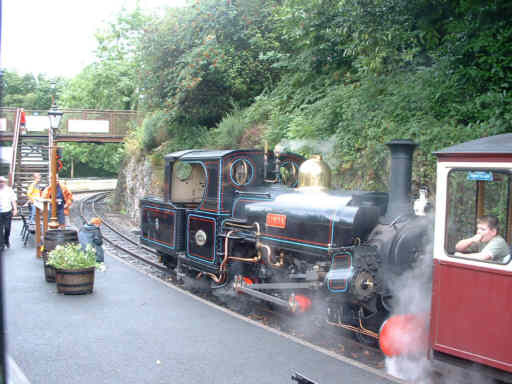 At Tan Y Bwlch we crossed Linda, an ex Penrhyn Quarries Hunslet 1883 built 2-4-0ST with tender to carry fuel. 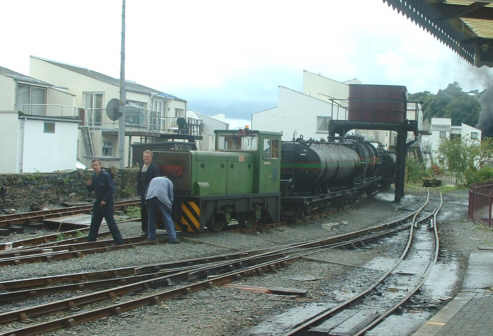 Originally an 0-4-0ST Linda and her sister Blanche were bought by the FR in 1963 and modified to suit the needs of the Ffestiniog. 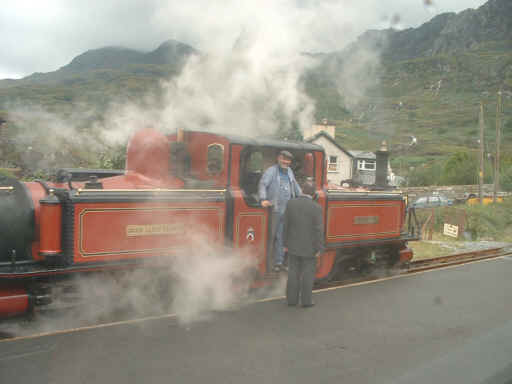 At the next loop at Tanygrisiau we crossed David Lloyd George which had worked back up to Blaenau and was returning to Porthmadog. Time and weather limited my photos this time but I'll be back as soon as I can to this lovely little line. There are views around the area on my other site at Snowdonia. 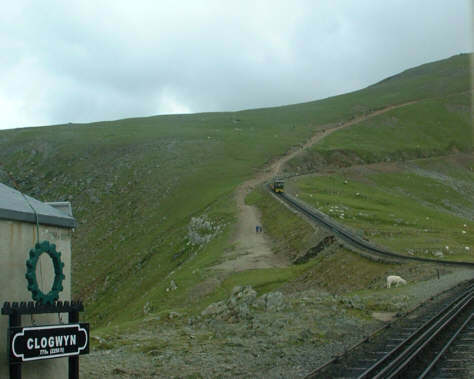 The Snowdon Mountain Railway is Britain's only rack railway, using cogs rather than friction for grip. 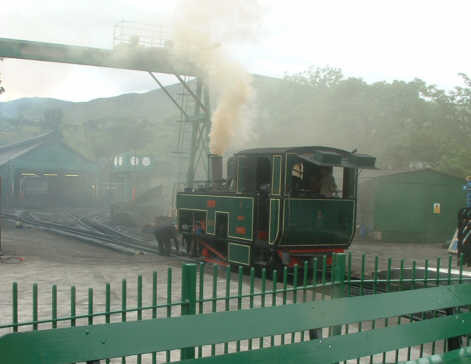 This is a view of their shed yard at Llanberis with one of their Swiss built steam locos taking coal and water ready for the next trip up the mountain. 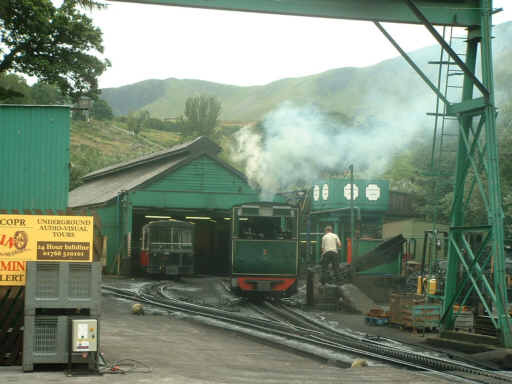 Another view of the shed as the loco moves off ready for her run up to the summit of the highest mountain in England and Wales. The mountain is 1,085m, the station is at 1.062m if I recall correctly. One of the lines Hunslet diesel locos then appeared with a service train which is, I think, used to take staff and supplies - including drinking water - up to the summit station. 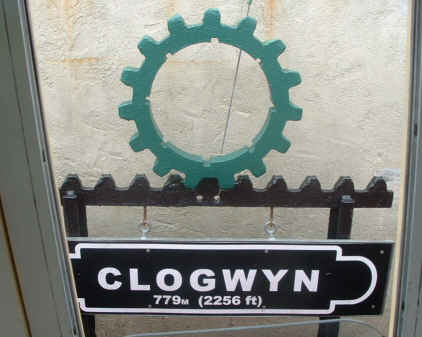 The station sign at Clogwyn, which is at 779m. There's some steep sections to get this far but from here the mountain part of the journey really seems to start. This photo from the train at Clogwyn shows another one climbing up the "final assault" on the summit. There are views from the summit and from the train on the trip up on my other site at Snowdonia. 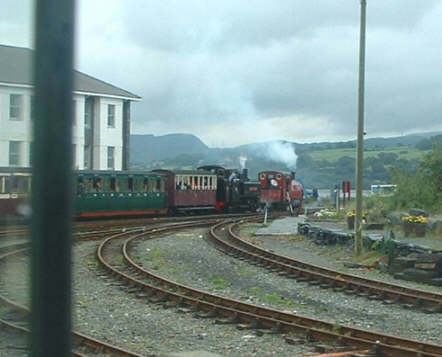 A view through the single carriage train as the oncoming steam working approaches Clogwyn. 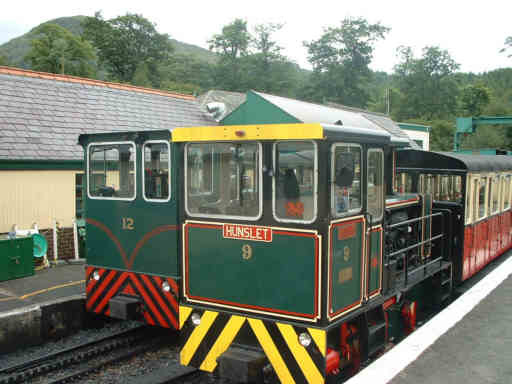 Some trains are steam worked but many are worked by Hunslet diesel locos such as this one seen close up at Llanberis. 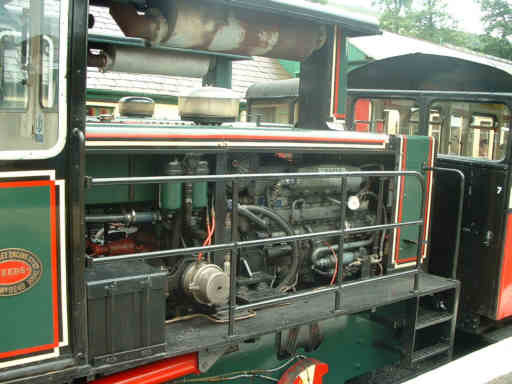 Another view of the diesel which had taken us to the top and back. An interesting detail is that the line is all downhill and therefore the carriages (all trains are single carriage) are not couple to the locos, gravity keeping them in contact on the descent and during shunting. They do have continuous brakes of course! 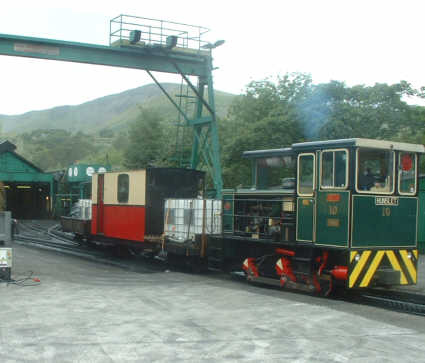 A last view of the Snowdon Mountain Railway, two of the Hunslet diesels side by side at Llanberis. One platform is used for arrivals, the other for departures as capacity is limited and tickets are issued for particular trains only. 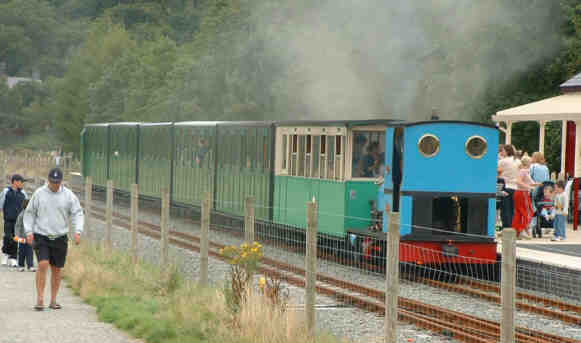 Llanberis' other railway, the Llanberis Lake Railway, which is a conventional 2ft. gauge line. 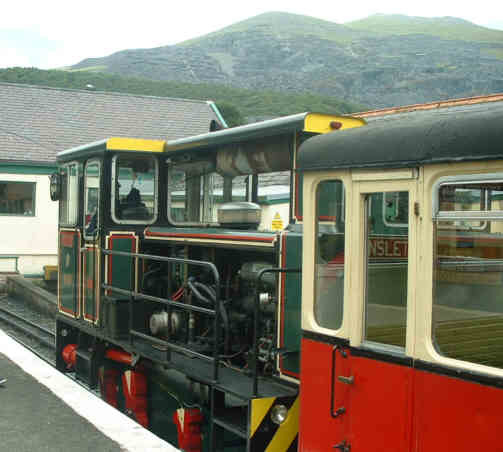 In this photo the a train is approaching the terminus at Llanberis. 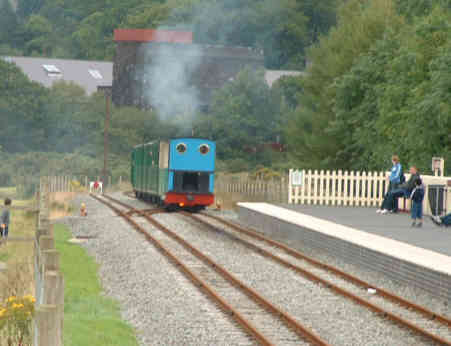 The train with its little blue engine is running into the terminus at Llanberis. 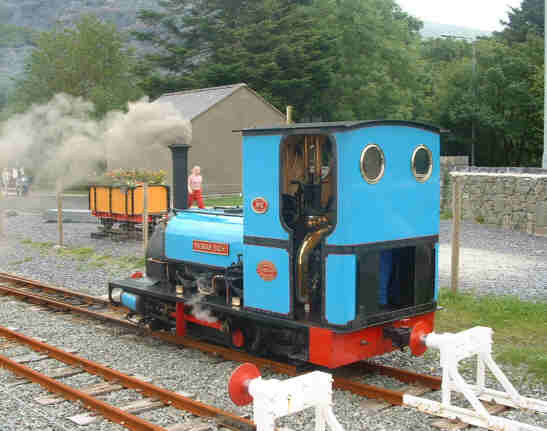 This little blue tank engine is named Thomas Bach, it originally worked in the nearby Dinorwic slate quarries. 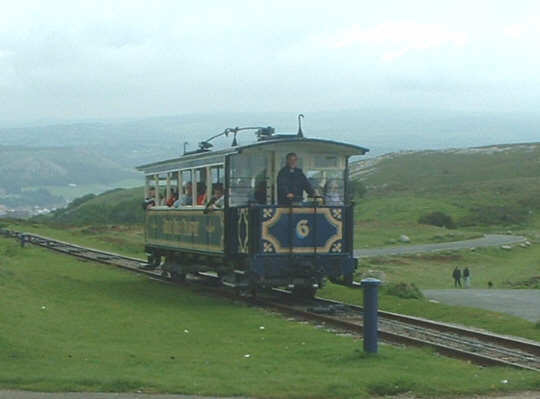 The Great Orme Tramway runs from Llandudno up to the summit of Great Orme. 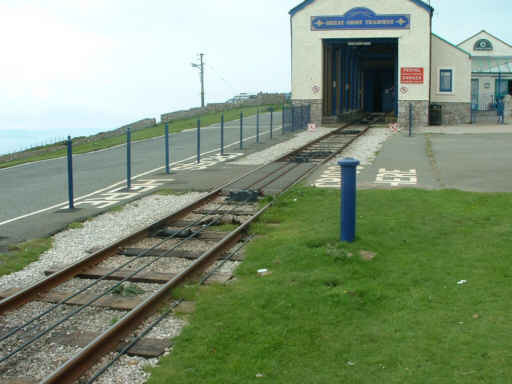 In this photo two cars are crossing on the upper section near the Great Orme Mine. A tram car nears the summit. 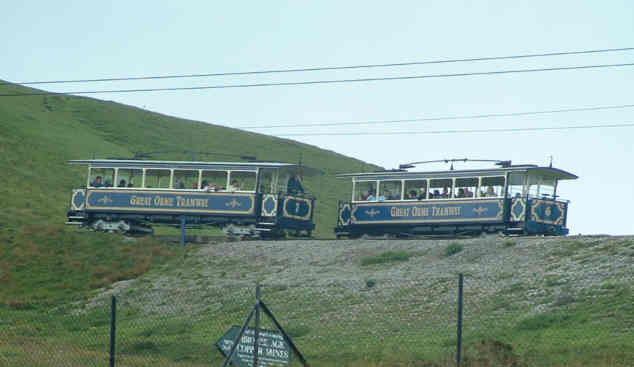 Views on and around Great Orme can be seen on Llandudno on my other site.